Although Brazil maintains notable production and significant trade in the visual arts sector, Art Law is still understudied, under-explored and lacks diffusion in the country, unlike what has been happening for years in Europe and in the United States. 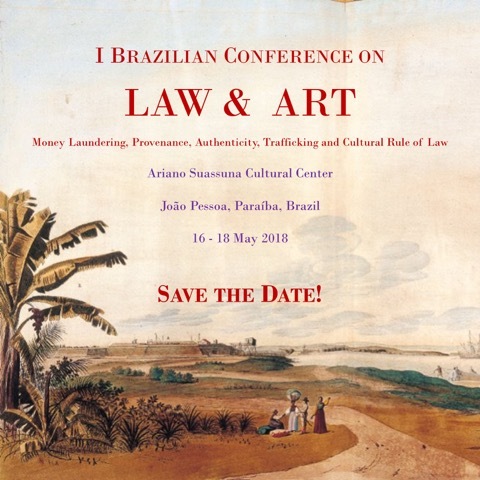 The First Brazilian Conference on Law and Art has the main objective of gathering public authorities, lawyers, gallerists, artists, curators, museums, auction houses, insurance companies, conservators, scholars and students from both undergraduate and graduate programs to share and discuss legal questions related to the protection, conservation, contracts, importation and exportation, financing, insurance, taxation, tax breaks, provenance, labor and consumer affairs, authenticity, protection, financial crimes, theft, compliance and the valuation in the increasingly complex and broad contemporary market of visual arts. To gather the legal community involved in the national art market in order to debate the regulation of the sector with important international specialists – precisely in the year in which the European Union celebrates the European Year of Cultural Heritage – reveals a useful and fruitful way for this important economic and cultural sector of Brazilian reality to become more secure, accessible and transparent to all those who are interested in it. Prof. Dr. Marcílio Toscano Franca (UFPB, MPC/PB and ILA Brasil), Profa. Dra. Inês Virgínia Soares (MPF/PRR3), Prof. Dr. Gustavo Rabay Guerra (UFPB and UNIPÊ), Profa. Dra. Alessandra Macedo Franca (UFPB), Prof. Dr. Marcelo Conrado (UFPR), Profa. Dra. Ângela Cássia Costaldello (UFPR and MPC/PR), Dr. Gustavo Martins de Almeida (OAB-RJ), Dr. Luiz Gustavo Vardânega Vidal Pinto (CFOAB’s Special Commission for Culture and Art), Dr. Fábio de Sá Cesnik (Cesnik Quintino & Salinas Advogados), Dr. Carlos Gastão (DPF/MJ), Dr. Alexandre Zielinsky Arregui (Rhône Trust Services).